Slow & steady, from New York to several Midwestern cities, thousands of fast-food personnel have been holding one-day strikes during peak meal times, quickly drawing national attention to their demands for higher wages. Their chief demand is for a hike in hourly wage to $15 in times of surge in cost of living. Contemporary median hourly wage in the fast food industry is $9.05 which seems to be out of sync in gratifying basic amenities. A Taco Bell worker, Sharise Stitt, 27, joined the strike, saying the $8.09 she earns after five years there was insufficient to support her family. She was evicted from her Detroit apartment and moved her family to her sister’s house in Taylor, Michigan. That means a 45-minute commute each way and a gas bill of $50 every four days. After taxes, she has about $900 a month to feed and clothe her three children. They receive food stamps. 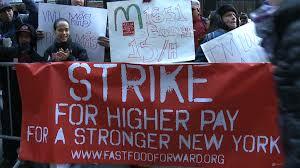 Regrettably, none of the nation’s 200,000-plus fast-food restaurants are unionized. The strategists know they want to achieve a $15 wage, but they seem to be ad-libbing on ways to get there. Perhaps they will seek to unionize workers at dozens of restaurants, although some labor leaders scoff at that idea because the turnover rate among fast-food employees is about 75 percent a year. Front-line jobs in the fast food industry—including cooks, cashiers, delivery workers, and other non- managerial positions—rank among the lowest-paying occupations in the U.S. economy. In response to growing criticism, industry spokespersons have defended low wages for front-line fast food workers by arguing that these jobs serve as stepping stones to higher-paying managerial positions, as well as opportunities to eventually own and operate a fast food franchise. These claims, however, are not supported by the facts. Managerial positions account for only a tiny fraction of jobs in the fast food industry, and opportunities for franchise ownership are even fewer. Moreover, the substantial financial resources required to open a fast food franchise make entrepreneurship an unrealistic option for front-line fast food workers earning poverty-level wages. Members of Congress call for passage of Fair Minimum Wage Act of 2013 after four years without a federal minimum wage increase; rallies planned in over 30 cities across the country to demand higher wages for millions of America’s lowest-paid workers. As four years pass without an increase in the federal minimum wage, a new poll released finds that 80 percent of Americans – including 62 percent of Republicans and 80 percent of Independents – support raising the minimum wage to $10.10 per hour and indexing it to the cost of living, as proposed in the Fair Minimum Wage Act of 2013 introduced by Sen. Tom Harkin and Rep. George Miller earlier this year. According to the poll, 74 percent of Americans consider raising the minimum wage to be an important legislative priority for Congress to address over the next year. As members of Congress, business leaders, and workers gather in Washington on Wednesday to call for immediate passage of the Fair Minimum Wage Act of 2013, thousands of low-wage workers and their supporters in over 30 cities throughout the U.S. will hold rallies at major retail and fast food corporations, as part of a National Day of Action to raise wages for millions of America’s lowest-paid workers. The Fair Minimum Wage Act of 2013 would raise the federal minimum wage from the current rate of $7.25 to $10.10 per hour by 2015, and it would provide for annual increases to the rate in future years to keep pace with the rising cost of living, a key reform known as “indexing” that ten states have already successfully implemented. The bill would also raise the minimum wage for tipped workers from its current low rate of $2.13 per hour, where it has been frozen since 1991, to 70 percent of the full minimum wage. Unemployment rate seems to have found a steady decrease in the country but does not reflect the problems faced by workers. More on state unemployment rates here.